The true story of Pfc. Desmond T. Doss (Andrew Garfield), who won the Congressional Medal of Honor despite refusing to bear arms during WWII on religious grounds. Doss was drafted and ostracised by fellow soldiers for his pacifist stance but went on to earn respect and adoration for his bravery, selflessness and compassion after he risked his life—without firing a shot—to save 75 men in the Battle of Okinawa. It took me long enough to finally watch Hacksaw Ridge. To be honest, I am not a fan of war stories. Even I haven’t watched the famous Pearl Harbor (2001). However, I have heard that this film is really good and a must-watch film. 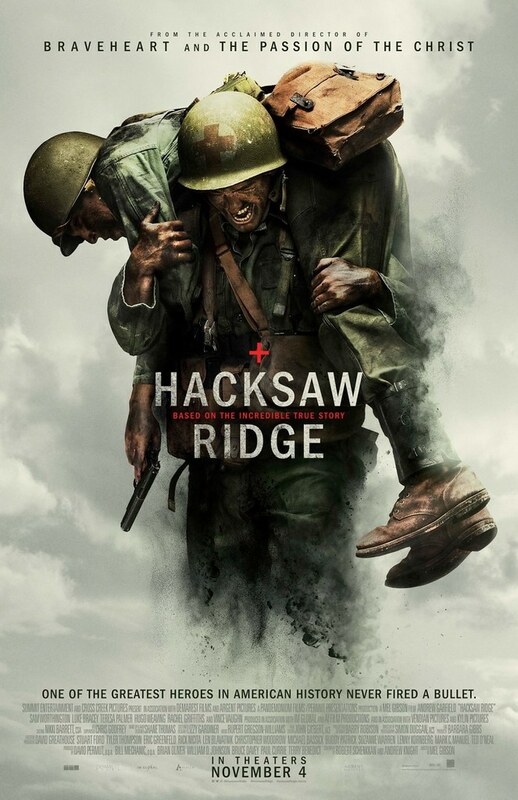 Therefore, despite my non-likeness of war films, I decided to watch Hacksaw Ridge. I must admit that this film is really good. Although I don’t really like films about war, I think Hacksaw Ridge is an exception.I never realised that Andrew Garfield is half British and do a British accent in his everyday life. I never realised that Andrew Garfield is half British and do a British accent in his everyday life. I always see him acting as American people and therefore, I thought he was American for sure. But no. He may half American but he does British accent because he grew up in the UK. That’s what makes his performance in Hacksaw Ridge is perfect. He did, I don’t know, Virginian accent? I don’t particularly I understand which accent belongs to which region but if Desmond Doss was from Virginia, so I guess Andrew Garfield did a Virginian accent. Andrew Garfield surely did it perfectly. It sounded convincing. His acting and facial expression are perfect. He has done a great job in portraying Desmond Doss, an American soldier during World War II. When Desmond Doss enlisted the army, everything when just fine until weapons training because apparently, Desmond Doss didn’t want to touch any weapon even though he wasn’t actually using it. Of course, everyone will think that idea was absurd. How can one survive in war without weapons? But Desmond Doss gave us proof that he could do it. Andrew Garfield has succeedingly portraying Desmond Doss. I think he deserved all the award nominations, including the Oscar nomination for Best Performance by an Actor in a Leading Role and Golden Globes nomination for Best Performance by an Actor in a Motion Picture in Drama category. Not only Andrew Garfield could capture the emotion, he also pulled it off in terms of acting and accent. I was surprised he didn’t win the Oscar or Golden Globes but I can’t say anything about it since I don’t watch Manchester by the Sea (2016) and therefore can’t judge Cassey Affleck’s acting in that film compared to Andrew Garfield in Hacksaw Ridge. I don’t know much about Mel Gibson as an actor or as a director, but I think in this film, he has directed it really great. Every angle was very well thought. Of course, the highlight of Hacksaw Ridge is the story itself. It’s very touching and inspiring. Hacksaw Ridge gives us many lessons to never judge a person in a hurry, that every person has their own rights and we have to respect their rights. This film also teaches us to always stand for what we believe in despite what other people said. As long as what we believe in is not wrong, we don’t have to change to satisfy others. At the end of the day, it’s what we believe in that made us who we are. These are the great lessons that we can learn from Hacksaw Ridge. Hacksaw Ridge is a war film and therefore brutality is inevitable. However, I think it’s less brutal and less bloody than Logan (2017). Although both films were given R-rated, Hacksaw Ridge is definitely not as bloody as Logan and therefore more bearable to watch. The setting of this film and all the clothes were all very well thought and prepared. We were brought back in time. You can also feel the tension during the war because the way they took the scene and all the acting of the actors were very stunning, thus making this film is a great total package.All the other actors also took part in making Hacksaw Ridge better than it already is. Every actor and actress play their part really well. Including how they manage to pull off their Virginian accent. All the other actors also took part in making Hacksaw Ridge better than it already is. Every actor and actress play their part really well. Including how they manage to pull off their Virginian accent. I haven’t seen much of Teresa Palmer’s films but she was also very good in this film. From her acting to her accent till her facial expression, she managed to pull it off really well.So overall, Hacksaw Ridge is a great film. A very enjoyable one, indeed. Despite not liking films about of war, I truly enjoyed this film very much. I think Hacksaw Ridge is not only giving us a good story but also a very inspiring one. So overall, Hacksaw Ridge is a great film. A very enjoyable one, indeed. Despite not liking films about of war, I truly enjoyed this film very much. I think Hacksaw Ridge is not only giving us a good story but also a very inspiring one. It’s touching and at the same time, we can learn so much from the film too. Inspired by a true story, Hacksaw Ridge managed to teach us many things, not only about the ironic of wars but also life lesson as well. I highly recommend this film very much. If you are like me, who don’t enjoy war film, I am pretty sure you will enjoy this one. With so many things that can be learnt from the film, Hacksaw Ridge is really worth to watch after all. I give Hacksaw Ridge 9 out of 10 stars.